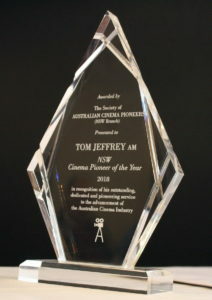 At the NSW Branch luncheon in Sydney on Thursday 24th May, Mr. Tom Jeffrey was presented the much coveted award as the 2018 NSW Cinema Pioneer of the Year. This auspicious award was certainly well deserved by Tom for his many decades of service in the development and progress of the Australian film industry. Tom is probably best remembered for the highly successful movie THE ODD ANGRY SHOT, which he wrote, directed and co-produced. He also directed David Williamson’s THE REMOVALISTS, produced and directed WEEKEND OF SHADOWS, co-wrote and co-produced FIGHTING BACK and produced THE BEST OF FRIENDS. Starting out in the early days of ABC Television at the Gore Hill studios in Sydney, as studio hand then floor manager and TV drama director, Tom went on to become a leading figure in the Australian film and television industries for more than four decades, with significant achievements in film production, training, management, policy, consultancy and international relations. 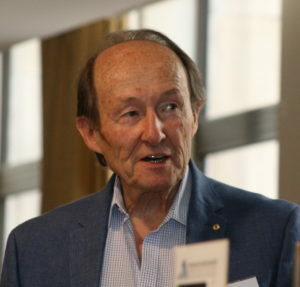 In the 1960s and 70s Tom was an early advocate for the re-establishment of the Australian film production industry, and was involved with a wide range of industry organisations and government bodies, including representing the Producers and Directors Guild of Australia on the Australian Film Council, Chairman of the Film, Radio and Television Board of the Australia Council; then Chairman of the Australian Film and Television School from 1976 to 81; and from 1997-2000 President of the Screen Producers Association of Australia. More recently, from 2006 to 2010 Tom was Chairman of the Board of Studies at the National Institute of Dramatic Art (NIDA), and from 2006 to 2012 was a member of NIDA’s Board of Directors. Tom received the 2006 ASDA Accreditation Award in recognition of Excellence in Direction. He was appointed President of the Australian Cinema Pioneers for 2007 and in November 2010 was made a Life Member of the Screen Production Association of Australia in recognition of his contribution to SPAA and to the industry. In May 2018, he was made NSW Cinema Pioneer of the Year.